Puerto Rico is an intoxicating blend of Spanish, Indian, and African influences, all melded into a tropical atmosphere of beaches, rainforest, and a fast-growing element of luxury. Whether you're hiking in a forest or climbing a cave; savoring superb cuisine, enjoying a sizzling nightlife and exciting casinos; taking romantic walks on a moonlit beach; renting a car to discover small towns, fishing villages and an amazing variety of cultural activities; planning an island escape with a stay in a Parador, Puerto Rico has it all and that's what makes Puerto Rico the All Star Island. The Puerto Rican islands are located in the Caribbean sea, just east of the Dominican republic, with about 3/4 Spanish and 1/4 English speaking natives. But don’t worry: all tourist areas are primarily English speaking. Puerto Rico is a commonwealth of the United States which includes one main island, Greater Antilles, and several smaller islands and keys. Let me provide you with a quick overview of the top 4 unique experiences awaiting you in Puerto Rico – hopefully these experiences will inspire you to turn your daydreams into actual holiday plans in Puerto Rico! You’ll have to wait for the sun to set if you want to see what might just be Puerto Rico's most spectacular natural phenomenon: bio bays. A bioluminescent bay is the result of a delicate ecosystem. Bio bays flourish when tiny single-cell organisms called dinoflagellates (pyrodinium bahamense) thrive in a protected environment. When they are agitated, they release energy in the form of light. In other words, they glow, emitting an ethereal neon green aura. So does anything they touch: fish, human hands, the oars of a paddle, even raindrops. There are only a few bio bays on Earth, and Puerto Rico has three of them! They are best enjoyed when there is no other light to minimize the bioluminescence. So when you go, avoid a full moon to get the best of this unforgettable experience. La Parguera was the first known bio bay in Puerto Rico and now is part of La Parguera Natural Reserve. You can reach La Parguera by kayak, small boat, or even a large, two-level, glass-bottom boat. This is the only bay that allows diesel-powered boats. The brightness in La Parguera may vary, depending on various changing factors in the natural ecosystem. It will be hard to capture this phenomenon on normal cameras – this video below by NatGeo will provide a preview of what the experience is like. There’s no other place like it in Puerto Rico. In fact, there’s no other place like it in the entire United States. 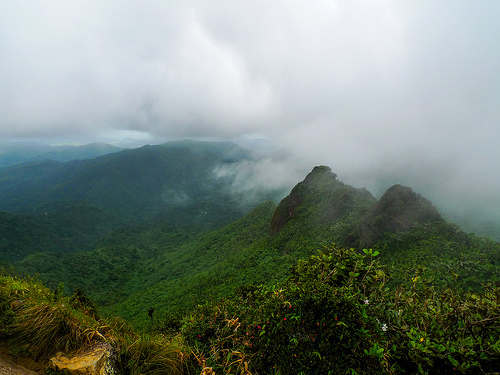 El Yunque is the only subtropical rainforest in the United States Forest System. Under its trees, you’ll find a unique ecosystem that has enchanted its visitors for centuries. There’s plenty of reasons why it is one of the world’s Top 28 New 7 Wonders of Nature. Its 28,000 acres are crisscrossed with hiking trails that will take on a mind-blowing journey. 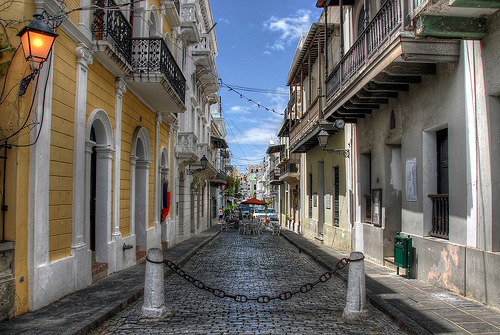 Stepping into Old San Juan’s blue cobblestone streets will feel like stepping out of a time machine. Once the crown jewel of the Spanish Empire in the Americas, the walled city still preserves its stunning colonial architecture, ranging from imposing fortresses to brightly colored buildings, many of which have been declared World Heritage Sites by UNESCO. Amidst is beauty lie some of the island’s best museums, restaurants, shops, and nightlife. No first trip to Puerto Rico is complete without a visit to Old San Juan. 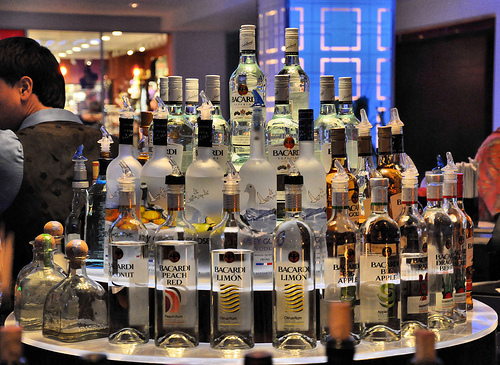 Taste the rum and practice the Salsa on the Caribbean island paradise of Puerto Rico. Indulge on the finest Spanish cuisine with a unique American, African and Taino twist. Taste succulent corn and fruits, crunchy cod fritters, black bean soup, kettle-cooked stews, lamb, fried beefsteak and onions, plus barbecued pig. For dessert, island guests enjoy some of the finest banana cupcakes, custard and nisperos de batata, or sweet potato balls with cloves, coconut and cinnamon. Then, don’t forget to tantalize your taste buds with Puerto Rican rum of any shade, the national drink. More than 70% of the rum sold in the U.S. comes from Puerto Rico; here at Puerto Rico, you can sample favorite local brands and enjoy a tour of Puerto Rico's rum distilleries. There’s only one Puerto Rico, but there are many ways to get here. There are over 588 non-stop flights to main cities in the United States, 30 flights to the Caribbean, and 28 flights to Central and South America every week. The island is also the cruise capital of the Caribbean; its ports welcome thousands of sea travelers daily. Puerto Rico is a U.S. commonwealth and the U.S. dollar is the official currency; U.S. citizens don’t need a passport or a currency converter! Just hop on a plane and go! If you’ll be visiting from another country other than the United States, a visa is required to enter the island. These requirements are standard and are the same as for entering the United States (http://travel.state.gov/). The purpose and extent of your visit will determine which visa to apply for. If you are just coming in as a tourist, the standard 90-day non-immigrant visa will be your key to paradise. 1. Leave a comment on this blog post about your favorite amenities in Puerto Rico – find your favorite here: SeePuertoRico.com **Examples: Flamenco Beach, old world charm of San Juan, etc.! 3. Like SeePuertoRico.com on Facebook. Leave a comment on the blog post stating you Liked them on Facebook.